I want to share what is probably my favorite talk I’ve ever given – so that you can use it to help guide men and women to make Godly decisions. 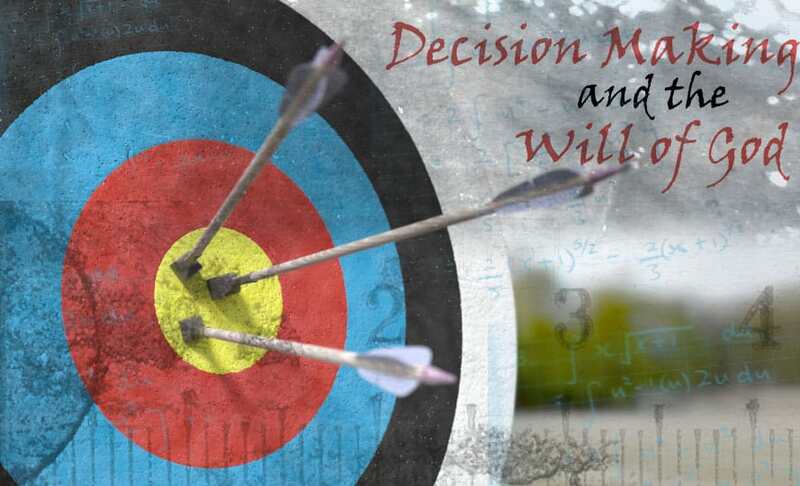 Most Christians have an unbiblical approach to discerning the will of God and making decisions. And many young people are paralyzed with uncertainty about what to do next with their lives (leaving them to delay real life and passively extend their adolescence). We are waiting for a sign from God – relying on arbitrary means like open door/closed door, signs, fleeces, and feeling a peace. What we should be looking for is not guidance but how to become a person that God can guide. And we need to consider what our worrying about the future tells us about our underlying, root sin – we don’t trust God and WE want to control our future. This talk is largely based on the book “Just Do Something” – a must read for everyone but especially those of you in college ministry. The book is short (as opposed to the OG book “Decision Making and the Will of God” book that weighs in at over 2 pounds) and brilliant. The talk also pulls some from Tim Keller’s incredible sermon “Your Plans, God’s Plans”. The reason I post them is for you to use them. Feel free to adapt or use as is. If you want to, you can let me know in the comments if you find them helpful. If God has a wonderful plan for my life, then why doesn’t He tell me what it is? Have you ever stopped to think about why life is like it is? Why did God set it up that we can’t see the future? So does God have a secret individual will that He expects us to figure out before we do anything? So does God have a specific plan for your life? How do you think Jesus felt about going to the Cross? But what do we pray for if we aren’t asking God to tell us exactly what to do? Illustration: You’re walking one day and come upon a small, handicapped child laying on the railroad tracks. The child cannot move, and you hear the sound of an oncoming train. Do you stop, get on your knees, and ask if it’s God’s will to pick up the child? If you don’t get a clear sense of God’s call, do you move on? Of course not. God’s will is clear. Save the life. I often think about this in regards to the question of whether or not we need to go overseas. Jesus made it clear that his will was for people of every nation to know the gospel. Why, then, are so many Christians waiting for God to spell out “Afghanistan” in their Cheerios—before they go? The call has been given. Go. If your talents can best serve God’s kingdom by using them overseas, why would you wait on a call to do so? Thank you SO much for making this available to use. The outline really helped me answer some questions with a group of seniors. Awesome! Thanks for taking the time to comment Melody! Very encouraging to hear that it was helpful.